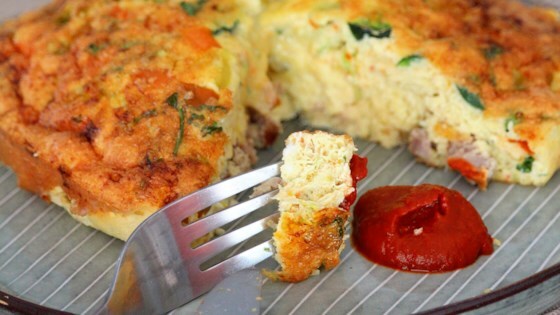 "Frittatas are easy to make using a cake pan that fits in the air fryer basket. Switch up the ingredients to suit your taste. If you are worried about the frittata sticking to the cake pan, line the bottom of the pan with parchment paper." Combine sausage, eggs, Cheddar-Monterey Jack cheese, bell pepper. onion, and cayenne in a bowl and mix to combine. Preheat the air fryer to 360 degrees F (180 degrees C). Spray a nonstick 6x2-inch cake pan with cooking spray. Place egg mixture in the prepared cake pan. Cook in the air fryer until frittata is set, 18 to 20 minutes. Good, but did not like this recipe as much as others I have tried for my air fryer. I will continue using my oven for egg recipes. Absolutely loved this! Added mushrooms, green onions and added an extra egg. Seasoned the egg mixture before cooking frittata. It was amazing! one of my first air fryer recipes attempted...substituted ham for the sausage and used cheddar cheese...cooked 360 for 18 minutes turned out great...will become a breakfast staple. Husband loved this, easy to fix....adaptable.....YUM! No, I didn't change anything but took away the red pepper, sausage, and green onion. I will have to make it again.